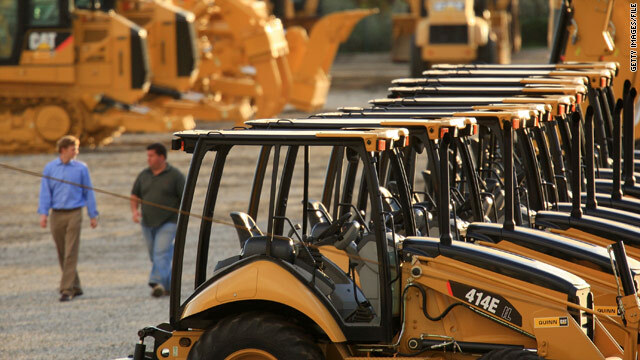 Times are tough at Caterpillar, where revenue declined 37 percent in 2009. Washington (CNN) -- It hasn't even been a week since President Obama signed sweeping health care legislation, but several companies already have warned shareholders they expect to take a hit. Manufacturer John Deere announced Thursday that it expected the company's expenses to be about $150 million higher than last year. That came a day after Caterpillar predicted a new cost of $100 million, and two days after AK Steel predicted a charge of $31 million. "Having an additional cost like this is not great timing," Caterpillar spokesman Jim Dugan said. As a deep recession spread last year, revenue for Caterpillar, the world's largest manufacturer of construction equipment, declined 37 percent from the previous year, and 19,000 workers were laid off worldwide. But in the last three months, the company has recalled 750 or so employees and projected higher sales in 2010. Caterpillar made a net profit in 2009 of $895 million out of $32.4 billion in sales, according to its Web site, while John Deere pocketed $873.5 million out of $23.1 billion in sales. AK Steel, however, suffered a $74.6 million loss on $4 billion in income. "That's a pretty big impact it will have on them," McDevitt said. White House spokesman Robert Gibbs defended the provision Thursday, saying the change really amounted to the closing of a loophole, because companies were not paying taxes on either the subsidy or on whatever money they spent on the retiree drug plans. Under the change, he said, "instead of there being a subsidy and what amounts to two deductions, there's now a subsidy and one deduction." Under the new law, the companies still receive a tax deduction for what they spend on the coverage. Defenders of the new tax also point out that before 2003, companies got no subsidy at all, so they're still coming out ahead if they get a taxed subsidy. The new law does not have an immediate effect on retirees and their benefits. But 10 top companies, including Caterpillar, John Deere, Verizon, Xerox, Boeing and Met Life, warned Congress in December that over the long term, it would. "Taxing the subsidy means that more companies will eliminate or reduce the coverage," they warned, "and more retirees will shift to Medicare ... which will create more cost for both the government and the retirees."